More often than not, I win our fights over anything and everything, and believe me we are quite passionate when it comes to arguing. One major battle I have lost at present, however, is the Milton in the bed. Despite my recent post when countless readers told us to give in and let Milt up, Jeff still bluntly refuses. He is resolute that our doodle is just too much of a dirty dog to be a cuddle bunny in bed. This has left me with no other option than to join Milt down in his lair. Recently, I have taken to squeezing in next to the Milt in the early morning hours for a little "Momma and Me" time. Truthfully, I pity Jeff because he's the one missing out, not us. Oh! I want Milt to have free rein now at seven months, but we are still just too nervous...! We don't let either of our dogs sleep in the bed as one weighs 100 pounds and sleeps spread eagle and the doodle......well, he's kinda dirty, slobbery, and ADHD so, yea, no dogs in the bed for us. Of course I sleep with Santa Clause so there isn't a lot of room left for me, let alone the dogs. Stan and I woller on the floor together every night and get lots of cuddle time then as he thinks he's a lap dog. Eight months and 27 inches at the whiters make for very long legs and not enough room on my lap. The Milt looks like he will be a monster, too. Lol! Hilarious! 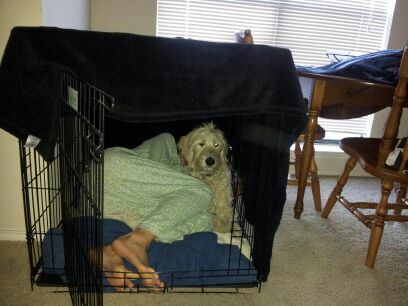 I bet Jeff is jealous he can't fit comfortably in the crate. If I did that Rich would lock me in! ha! Rich would never do that, especially now that you are the soon-to-be mother of his child!